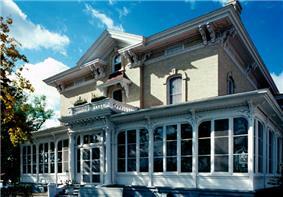 There are NRHP listings in all of Wisconsin's 72 counties. 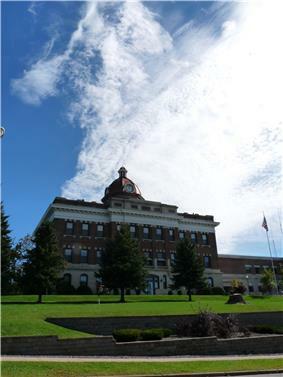 This list is intended to provide a comprehensive listing of entries in the National Register of Historic Places in the counties covered. 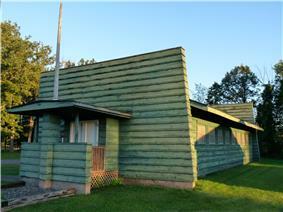 National Register properties located in Wisconsin are distributed across all of Wisconsin's 72 counties. The locations of National Register properties and districts (at least for all showing latitude and longitude coordinates below), may be seen in a Google map by clicking on "Map of all coordinates". Friendship 1914 Neoclassical building, designed by Arthur Peabody, sited in Friendship after a hotly contested vote with the neighboring city of Adams. 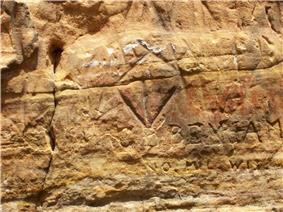 Friendship Oneota rock art on a sandstone bluff, vandalized by early soldiers and settlers. Hertel A group of well-preserved circular and linear mounds constructed from Middle Woodland to historic times. (#80000109) 214 N. Oak St.
Grantsburg 1907 building that housed the Burnett County Abstract Company which performed title searches, facilitating transfers of real estate in the county. 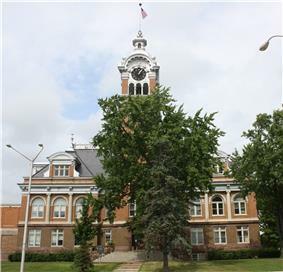 The Burnett County courthouse was located across the street until the county seat was moved to Siren. 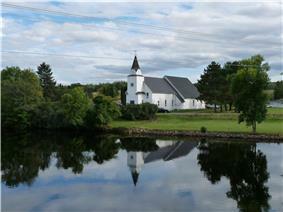 Daniels Swedish Lutherans built this church at Mud Hen Lake in 1886, but the congregation moved in 1893. The building has been the Daniels Town Hall ever since. Grantsburg Clapboard, side-gabled house built in 1873. Coordinates missing Webster Site of competing British fur trading posts of North West Company and XY Company from 1802 to 1805, now reconstructed at Forts Folle Avoine Historical Park. Grantsburg Remnants of the retreating Cambrian sea left deep sandstone which was carved by glacial meltwater, revealing cliffs revered by indigenous people. Colfax Built around 1915 with local Colfax sandstone, the building housed the police station, fire station, meeting rooms, library, auditorium and banquet hall. (#06001117) N end of Shorewood Dr.
Menomonie Knapp, Stout and Co., Menomonie's huge lumber company, started Evergreen as a private cemetery in 1873. Menomonie Many buildings older than 100 years, including Italianate and Queen Anne styles, with facades of locally made brick and locally quarried sandstone. 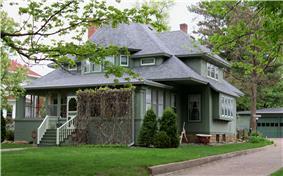 Menomonie 1890 home built by Andrew Tainter, a lumberman partner in Knapp, Stout and Co., for his son. Designed in Richardsonian Romanesque style by Harvey Ellis. 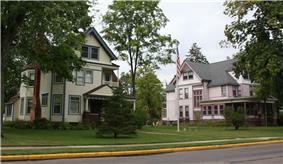 Later a women's dormitory and now offices of UW-Stout. 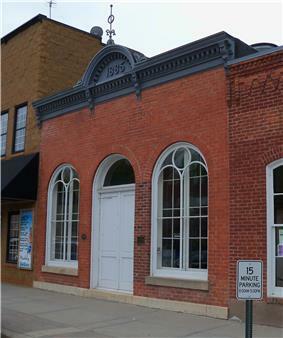 Menomonie Theater, library, and meeting building completed in 1889. Andrew Tainter and his wife built it to honor their daughter Mabel, who enjoyed the arts and died at age 19. Menomonie Three oval mounds remain. Before seventeen nearby mounds were submerged beneath Lake Menomin in the 1950s, some were excavated and dated 1000 to 1400 CE. A person was found cremated wearing a clay mask in one. 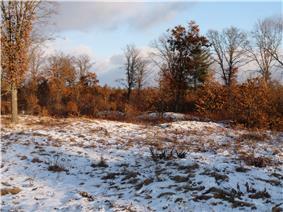 Long Lake Woodland/Oneota village site. Florence One to six room school, built in 1921 in Colonial Revival style. Florence Town hall with public auditorium designed by Max Hanisch, Sr. in Art Moderne style and built in 1936. Florence 2-story, stucco-clad Prairie School house built in 1899. Along with the Fulmers, it was owned by Max Sells, a Florence attorney. Florence Highway bridge, built 1910-11 to Dickinson County, Michigan because the Twin Falls Power Dam would soon flood the previous bridge. One of two pin-connected, camelback, through-truss bridges remaining in Wisconsin. Site of liquor inspections from 1914-20, when Michigan was dry and Wisconsin wet. 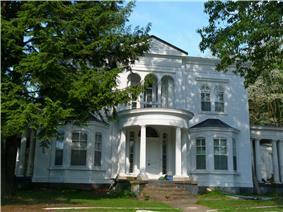 Florence Queen Anne-styled home built in 1883 with bargeboards and elaborate porches. Robert was involved in mining and ran a hardware store in Florence. (#11000841) Old 101 Rd. over Armstrong Cr. Armstrong Creek Standard, Prat pony truss bridge built of steel in 1908. This type was once common on Wisconsin roads, but only a handful remain. Hiles 20 sites spanning 4000 years of Native American occupation. (#95001506) 5466 Connor Farm Rd. Laona 1890s logging camp and the farm that supplied that camp. Now a living history museum. 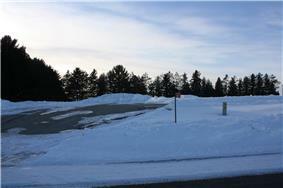 (#93001446) 4556 N. Branch St.
Wabeno 1897 log building from which land was sold. Now Wabeno's public library. Mole Lake, Wisconsin (listed as Crandon) 1870s location of a stopping place on the Military Road north of Green Bay. The cabin was once occupied by the father of Karen Blixen who wrote Out of Africa, during his trapping and trading days. Under restoration as of 2010. Alvin Rustic-styled buildings built by CCCs and WPA starting in 1936. Carter One-company lumbering town which boomed from 1899 until the mill burned in 1931. Abandoned by 1939. (#99000684) Approx. 80 meters S of Spring Pond Rd. Lincoln The 1933 cedar log structure was built by a CCC camp to protect the spring, which was their water supply. Water from the spring has special significance to the Potawatomi. 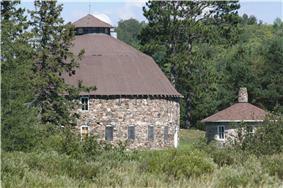 Hurley Round barn and round milkhouse built of fieldstones in 1917 by Finnish stonemason Matt Annala. Montreal The Montreal Mining Company built a planned community for employees in the first few decades of the 20th century, including arrays of homes for workers, the mine's machine shop, the Hamilton Club, the Roosevelt school, community gardens, and Sacred Heart of Jesus Catholic Church. 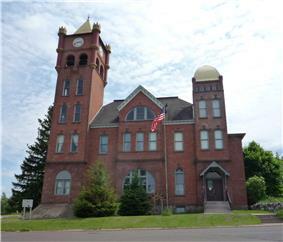 Hurley 1893 courthouse with a 1922 Seth Thomas clockworks. 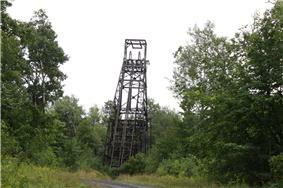 Pence Headframe from which miners were lowered into a 2367 foot iron mine that operated from 1904 to 1924. Now the last headframe standing in Wisconsin. 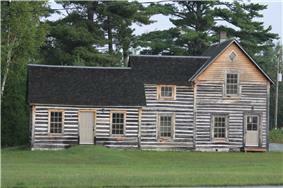 Sherman Habitation on Stone Lake, where Chippewas once made maple sugar, where French Canadians settled around 1868. Later a northwoods resort. Komensky Ho-Chunk ceremonial center since at least 1884, where the people gather for ceremonial dances, meetings, and socializing. Black River Falls 1914 Carnegie library designed by Henry Ottenheimer with Prairie school influences. 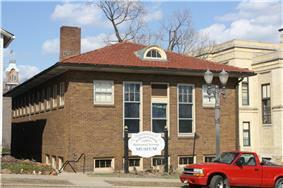 Now a museum of the Jackson County Historical Society. 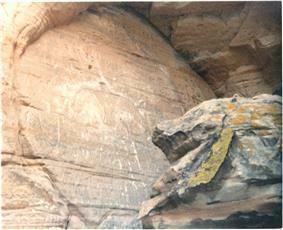 Irving Rock shelter with petroglyphs. (#75000067) Western side of Highway 95 south of Schroeder Rd at KOA campground. Alma Center Bluff where Paleo-Indians quarried quartzite for tools shortly after the last glacier receded. This Hixton orthoquartzite is distinctive, so the distribution of the tools gives clues about very early travel and commerce. 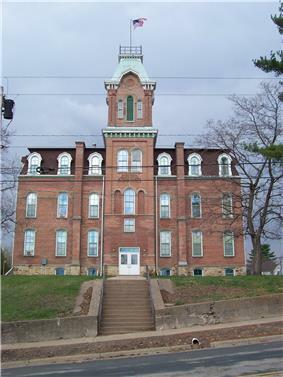 (#78000103) N. 3rd St.223 N. Fourth St.
Black River Falls 3-story brick school with tower designed by W.H.J. Nichols in Second Empire style and built in 1871. 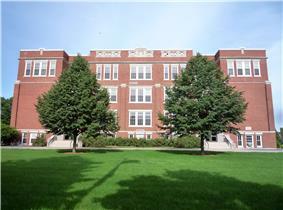 Served as high school until 1897, then elementary school, and now elderly housing. (#76000066) 211 N. Union St.
Mauston Victorian house begun in 1875 by Boorman, owner of Mauston's early grist mill, lumber mill and carding mill. 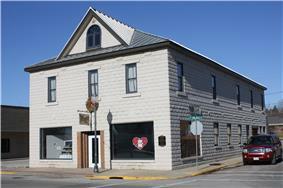 Now the home of the Juneau County Historical Society. Coordinates missing Armenia Mound complex constructed by Woodland people around 100-800 CE. 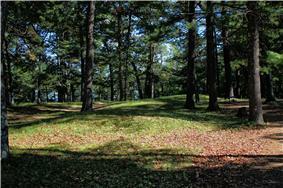 Includes hundreds of low conical mounds, mostly in lines. Also a bird effigy and a bear or panther. Coordinates missing New Lisbon Linear mounds, round mounds, and a running panther effigy mound constructed by Native Americans of the Woodland period. 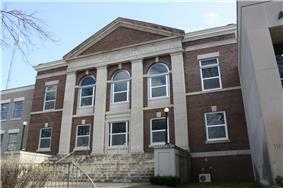 (#82001846) 220 E. State St.
Mauston Modern-styled courthouse built in 1938 with help of the WPA. Kildare Etchings of thunderbirds on a sandstone wall. Also known as Twin Bluffs petroglyphs. 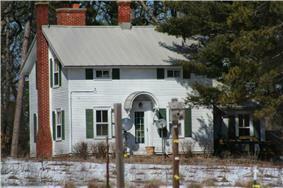 Seven Mile Creek Farmhouse started in 1863. In the 1920s the farm was state of the art, based on advice from university and farming magazines. Finley Pratt half-hip pony truss bridge, constructed in 1913. Necedah Neoclassical home built in 1860 by Thomas Weston, an early settler and founder of the lumber enterprise T. Weston & Co., which at one time sawed ten million board feet of lumber per year. Charles Babcock founded the Necedah Bank. 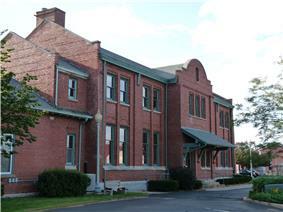 Antigo Former Chicago and North Western Railway depot, designed by Charles Sumner Frost in Classical Revival style and built in 1907 of locally-produced brick. Now renovated as apartments. Antigo Theater built in Classical Revival style in 1905 to seat 1100. 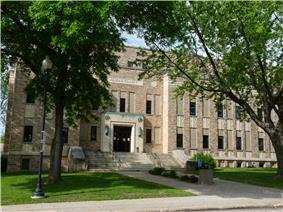 Served as an armory during World War I.
Antigo Classical Revival building with Beaux-Arts influences, built in 1916. Antigo The Deleglise cabin was the first house in Antigo, built in 1878. 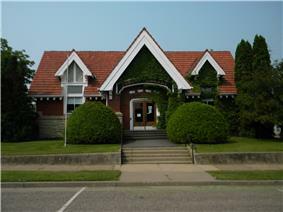 The former Carnegie library, built 1903-1905 and styled Colonial Revival, is now the Langlade County Historical Society Museum. (#94000600) Roughly bounded by Cedar, Park, Third, Center and Seventh Sts. 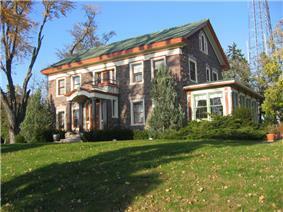 Queen Anne, Colonial Revival, and Prairie Style. Merrill Three-arch stone bridge built in 1904 of granite rubble by Fred Hesterman. It is the only such bridge left in Wisconsin. (#78000116) 1110 E. Main St.
Merrill Beaux-Arts courthouse designed by Van Ryn & DeGelleke and built in 1903. (#78000117) 717 E. 2nd St.
Merrill Former city hall, constructed in 1889 in Queen Anne style. Now apartments. (#00001258) 430 E. Second St.
Merrill Neoclassical building with octagonal skylight, built in 1915. 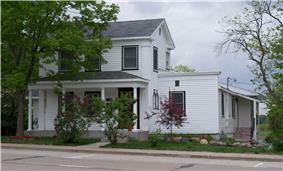 (#74000096) 106 W. 1st St.
Merrill Established in 1891 by Thomas Blythe Scott, lumberman and legislator. First public library in Wisconsin to offer English classes for immigrants. Part of the current building was built in 1911 with a Carnegie grant. Briggsville Estate of the Atwood, Ormsby and Green family, which served as an artist's retreat in the 1920s and 1930s, with visits from Robert Fitzgerald, Zona Gale, Paul Robeson, and others. (#90000471) Co. Hwy. F and Gillette Rd. Montello Boyhood home of naturalist John Muir, where some of his ideas were formed. (#82000685) 77 W. Park St.
Montello 1918 Beaux-Arts courthouse built of Montello granite and Bedford limestone. (#96000238) Roughly, parts of W. Montello and Main Sts. at the Montello R. and the quarry on E. Montello St.
Montello Quarry which operated from 1881 to 1976, most notably providing red granite for President Grant's tomb. Also old Italianate and Queen Anne buildings. (#96000908) 55, 103, and 105 Underwood Ave.
Montello Colonial Revival house designed by Parkinson & Dockendorff and built in 1912 for the president of the Montello Granite Company from locally quarried granite. (#07000556) 55 W. Montello St.
Montello Cement block building built in 1912 as a blacksmith shop with a community hall upstairs. Later a garage, car dealership, hardware store, and now a museum. Menominee Reservation Cemetery established around 1876 and Catholic church building built in 1891. 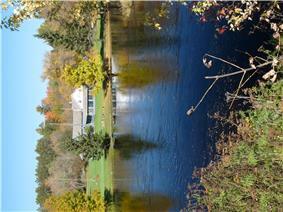 Some Menominee culture was preserved at South Branch because of its distance from supervision at Keshena. (#80000173) 315 W. 2nd Ave.
Durand Durand's library began above a feed store in 1886. The current Tudor-styled building was built starting in 1907, with a Carnegie grant and local limestone. Durand 1874 wood-framed Greek Revival building where a man was once lynched. Now a museum. Diamond Bluff At least two villages, surrounded by hundreds of burial mounds and a bird and several animal effigy mounds. Some think this might be a place where Late Woodland culture transitioned to Oneota. (#07000501) 220 N. Third St.
River Falls Freeman was a local druggist who built the house in 1908, mixing elements of the Queen Anne, Shingle and Colonial Revival architecture styles. River Falls Public pool complex constructed by the CWA, PWA and WPA from 1933 to 1937, during the Great Depression. Still in use. 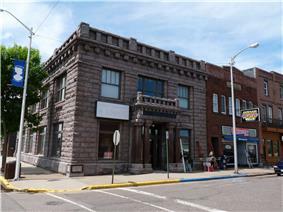 Prescott 1885 bank building with Italianate and Romanesque elements. Now houses visitor center. (#82000696) 411 W. Main St.
Ellsworth 1905 building with Neoclassical and Beaux-Arts elements. (#84003775) 331 N. Lake St.
Prescott 1853 Greek Revival home built in 1855 Daniel, who was a shopkeeper, hotelier, coroner, sheriff, and civic leader. His wife Salome also taught school in the house. (#76000073) 320 E. Cascade Ave.
River Falls Site of the sole building when the fourth Wisconsin Normal School started at River Falls in 1874. It burned in 1897 and was rebuilt in 1898. Now South Hall at the University of Wisconsin-River Falls. 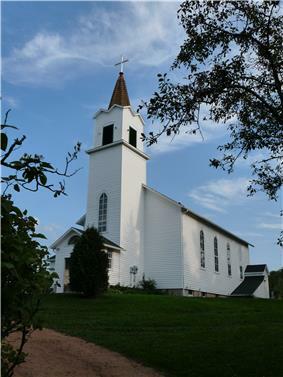 Washington Oldest church in Rusk County, built on the banks of the Chippewa River in 1882, during the peak of log driving, to serve the French and Indian community called Flambeau Farms. (#80000192) 102 W. 2nd St.
Ladysmith 1912 Classical revival building with facade of rusticated granite, formerly known as Pioneer Bank, the Rusk County Bank, and "the bank with the clock." Ojibwa Log tavern built around 1874 - one of many rest stops on the old Chippewa Trail stage line, which generally followed the course of modern Highway 40 from Chippewa Falls north into the pinery. This stopping place served loggers, trappers and rivermen with a saloon downstairs and sleeping rooms upstairs. Hayward 2-story brick headquarters built in 1889 by one of the major logging companies in the Namekagon watershed, founded by A. J. Hayward and R. L. McCormick. Radisson 1922 newspaper office in Ojibwa, a community planned to settle immigrant farmers in Wisconsin's cutover. Maple Grove One-room schoolhouse built in 1928. 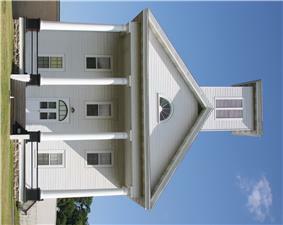 Later served as town hall. Apparently burned in February 2011. (#13000865) 237 S. Sawyer St.
Shawano K-8 school designed by Parkinson & Dockendorff in Collegiate Gothic style and built in 1925. Progressive for its time, it contained manual training and domestic science rooms, a gym with showers, and an inviting kindergarten room with a fireplace and a bay window. Gresham Mission church and school built in 1901 by Missouri Synod to serve Stockbridge Indians. The school operated until 1958 and the church continues today. (#99000440) Roughly including E. Division St. and S. Main St.
Shawano Various brick commercial buildings as old as the late 1800s. 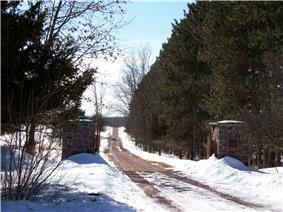 Main Street lies on the old military road from Green Bay to Ontonagon. 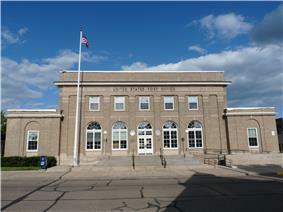 (#00001241) 235 S. Main St.
Shawano New Deal post office with mural by Eugene Higgins. 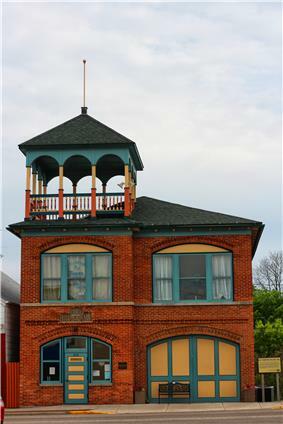 Tigerton Municipal building and fire station, built in 1905 with support from Herman Swanke, partly to protect his nearby lumber mill. (#83004320) 202-204 S. Main St.
Medford This 1912 Beaux-Arts building housed the post office until the 1930s, then Gruener's Bakery, and now Damm Accounting. Perkinstown About 100 "stray band" Potawatomi, Chippewa and others lived at this remote site from 1896 to 1908. Includes burials and dance ring. (#74000127) S of WI 73 on Bridge Dr.
Jump River 1915 example of Prairie School architecture, designed by Purcell & Elmslie to suggest a logging camp building, or possibly a wannigan. (#93000259) 104 E. Perkins St.
Medford This Carnegie library was designed in Prairie School style by Wausau architect Hans Liebert and built in 1916. (#00001244) 304 S. Main St.
Medford The Colonial Revival-styled post office was built in 1937. It is now used by other businesses. (#84003784) Roughly bounded by Mondeaux River and Forest Rd. Westboro Flowage, campgrounds, and lodge, built by the WPA and CCCs from 1936 to 1938. Town of Greenwood Classic wooden Gothic Revival church built in 1888, at a rural crossroads a few miles east of Chelsea. (#80000198) 224 S. 2nd, Courthouse Sq. Medford Classical Revival courthouse with metal clock dome designed by B. Mehner and built in 1913. Spooner 1917 Prairie School home designed by Purcell & Elmslie. Mrs. Polson built the house as a wedding gift for her son and his wife. Spooner Queen Anne-styled home built by the owner of Spooner's Big C.O.D. Bee Hive department store of the early 1900s. Pine River Kimball was a local merchant in Pine River, and eventually a US Congressman. He built this house in 1860 in Greek Revival style and remodelled it in 1901 to the then-popular Colonial Revival style. 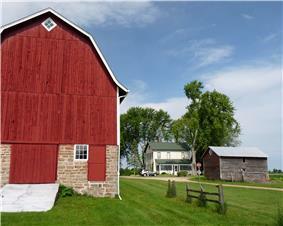 Included in the listing are garages, an 1860 barn, and a gazebo. (#82000729) 209 St. Marie St.
Wautoma The sheriff's residence and jail is a 1908 brick quoins, designed by C. H. Williams. The courthouse is a Neoclassical building designed by E. A. Stubenrauch and built in 1928. Coordinates missing Hancock Two lines of conical mounds and an oval enclosure wall 120 by 51 feet. Probably constructed between 500 and 1200 CE by Late Woodland people. ^ a b c d e f g h i j k l m n o p q r s t Numbers represent an ordering by significant words. Various colorings, defined , differentiate National Historic Landmarks and historic districts from other NRHP buildings, structures, sites or objects. ^ a b c d e f g h i j k l m n o p q r s t The eight-digit number below each date is the number assigned to each location in the National Register Information System database, which can be viewed by clicking the number. 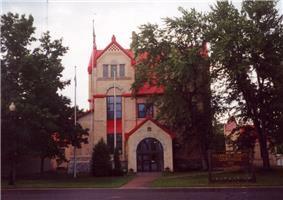 ^ "Adams County Courthouse". Wisconsin Historical Society. Retrieved 2011-10-30. ^ "Gunning-Purves Building". Wisconsin Historical Society. Retrieved 2015-10-31. ^ "3 more added to historic list". The Milwaukee Journal. 1980-04-27. Retrieved 2012-06-01. ^ Jappe, Nancy (2006-04-05). 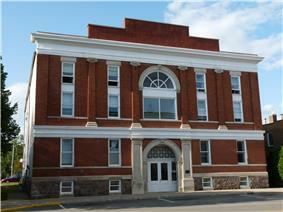 "Future of Historic Town Hall in Question" (PDF). Inter-County Leader. Retrieved 2011-11-03. ^ "John P. Jacobson House". Architecture and History Inventory. Wisconsin Historical Society. Retrieved 2013-07-09. ^ "Northwest and XY Company Trading Post Sites". Wisconsin Historical Society. Retrieved 2011-10-26. ^ "Forts Folle Avoine Historical Park". Burnett County Historical Society. Retrieved 2011-10-26. ^ "Colfax Municipal Building". Wisconsin Historical Society. Retrieved 2011-11-05. ^ "Evergreen Cemetery". UW-Stout. Retrieved 2011-11-05. 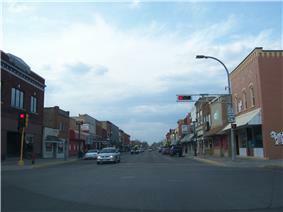 ^ "Welcome to Historic Downtown Menomonie". Main Street Menomonie, Inc. Retrieved 2011-11-05. ^ Hoffman, Arnie (1976). "Knapp-Stout Co. - perfect combination". Eaut Claire Leader Telegram special insert "Our Story". Retrieved 2011-11-05. ^ "Louis Smith Tainter House". 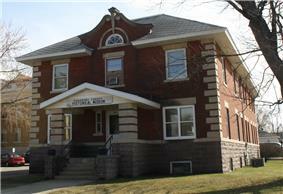 Dunn County Historical Society. Retrieved 2011-11-05. ^ "Louis Smith Tainter House". UW-Stout. Retrieved 2011-11-05. ^ "History of the Mabel Tainter Center for the Arts". Mabel Tainter Center for the Arts. Retrieved 2011-11-05. ^ Birmingham, Robert A.; Leslie E. Eisenberg (2000). Indian Mounds of Wisconsin. Madison, Wisconsin: Universityof Wisconsin Press. p. 201. ^ "Wakanda Park Mounds". Retrieved 22 November 2012. ^ "Fern School". Architecture and History Inventory. Wisconsin Historical Society. Retrieved 2013-06-01. 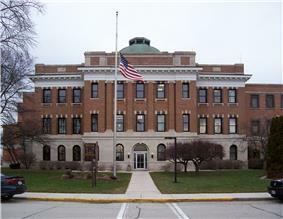 ^ a b "Main Page Photos of Wisconsin Courthouses". Wisconsin Register of Deeds Association. Retrieved 2011-12-17. ^ "Florence Town Hall". Architecture and History Inventory. Wisconsin Historical Society. Retrieved 2014-04-28. ^ "David M. and Lottie Fulmer House". Architecture and History Inventory. Wisconsin Historical Society. Retrieved 2014-05-17. ^ Wisconsin State Journal. 1935-01-17 http://genealogytrails.com/wis/florence/florobit.htm. Retrieved 2014-05-17. ^ "Robert B. And Estelle J. Webb House". Architecture and History Inventory. Wisconsin Historical Society. Retrieved 2014-05-17. ^ Men of Progress: Embracing Biographical Sketches of Representative Michigan Men. Detroit, Michigan: Evening News Association. 1900. p. 353. ^ "Armstrong Creek Bridge". National Register or State Register. Wisconsin Historical Society. Retrieved 2012-01-01. 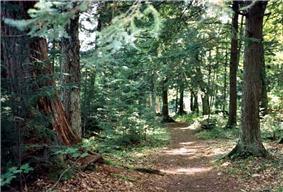 ^ a b "UW-SP Students partner with FS to interpret Butternut-Franklin Historic District Trail". U.S. Forest Service. Retrieved 2011-11-10. 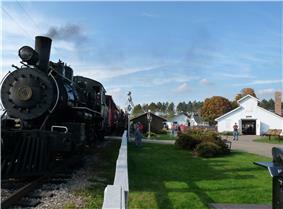 ^ "Home of the Lumberjack Steam Train - About the Logging Camp". Camp 5 Museum Foundation. Retrieved 2011-11-10. ^ "Chicago and North-western Land Office". Architecture and History Inventory. Wisconsin Historical Society. Retrieved 2014-06-02. ^ McCann, Dennis (2007-08-12). "Dinesen log cabin gets another chance". Milwaukee Journal-Sentinel. Retrieved 2011-11-10. 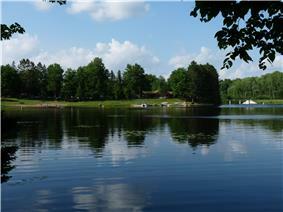 ^ "Franklin Lake Campground". Wisconsin Historical Society. Retrieved 2011-11-10. ^ "Minertown-Onerva". Wisconsin Historical Society. Retrieved 2011-11-10. ^ "Otter Spring House". Wisconsin Historical Society. Retrieved 2011-11-10. ^ "Matt Annala Round Barn". Architecture and History Inventory. Wisconsin Historical Society. Retrieved 2014-06-08. ^ "Matt Annala Milkhouse". Architecture and History Inventory. Wisconsin Historical Society. Retrieved 2014-06-08. ^ "Montreal Company Location Historic District". Wisconsin Historical Society. Retrieved 2011-11-13. ^ "Penokee Iron Range Trail - a Company Town". The Historical Marker Database. Retrieved 2011-11-13. ^ "List of properties in Montreal Company Location Historic District". Architecture and History Inventory. Wisconsin Historical Society. Retrieved 2014-06-08. 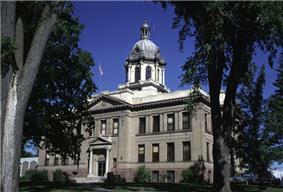 ^ "Iron County Courthouse". Wisconsin Historical Society. Retrieved 2014-06-08. ^ "Penokee Iron Range Trail - Plummer Location". The Historical Marker Database. Retrieved 2011-11-13. ^ "Iron County Development". Iron County Development Zone. Retrieved 2014-06-08. ^ "Springstead Post Office". Architecture and History Inventory. Wisconsin Historical Society. Retrieved 2014-06-08. ^ "Black Hawk Powwow Grounds, Jackson County, Wisconsin". National American Indian Heritage Month. National Park Service. Retrieved 2014-06-08. 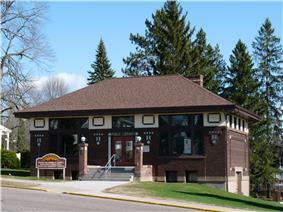 ^ "Black River Falls Public Library". National Register or State Register. Wisconsin Historical Society. Retrieved 2014-06-08. ^ Seurer, Daniel. "Gullickson's Glen". Retrieved 2011-11-20. 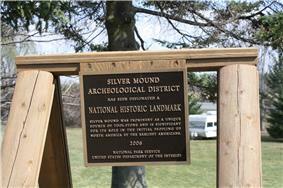 ^ "Silver Mound Archaeological Site". Mississippi Valley Archaeological Center at the University of Wisconsin–La Crosse. Retrieved 2011-05-18. ^ "Union High School". Architecture and History Inventory. Wisconsin Historical Society. Retrieved 2014-01-22. 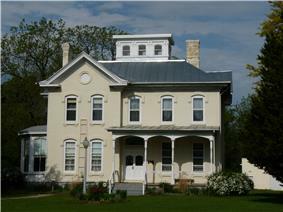 ^ "Mauston Wisconsin's Historic Boorman House". Juneau County Historical Society. Retrieved 2011-11-23. 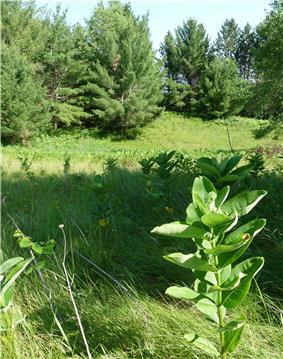 ^ "Cranberry Creek Mound Group (No. 203)". Wisconsin State Natural Areas Program. Wisconsin Department of Natural Resources. Retrieved 2011-11-23. ^ "New Lisbon Indian Mounds Park". Andrew Khitsun. Retrieved 2014-06-10. ^ Balousek, Marv (1998). Wisconsin's Historic Courthouses. Illustrated by L. Roger Turner. Oregon, Wisc. : Badger Books, Inc. p. 63. ^ "Western Wisconsin Rock Art Sites - Twin Bluffs". Mississippi Valley Archaeology Center. Retrieved 2011-11-26. ^ "William and Mary Shelton Farmstead". Wisconsin National Register of Historic Places. Wisconsin Historical Society. Retrieved 2011-11-26. ^ "Sprague Bridge, over Yellow River, Between Armenia and Necedah". 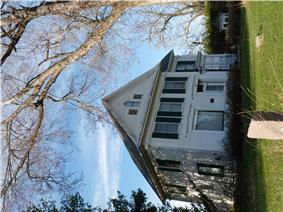 Historic American Building Surveys, Engineering Records, Landscape Surveys. Library of Congress. Retrieved 2011-11-26. ^ "Weston-Babcock House". Architecture and History Inventory. Wisconsin Historical Society. Retrieved 2013-06-18. ^ "Necedah". Adams County Press. 1871-05-13. Retrieved 2013-06-18. ^ "The Depot". Heartland Properties. Retrieved 2011-12-11. ^ a b "City of Antigo Comprehensive Plan" (PDF). City of Antigo. Retrieved 2011-12-11. 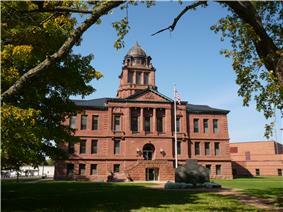 ^ a b c "Self-Guided Walking Tour of Historical Buildings in Antigo, WI" (PDF). Langlade County Historical Society. Retrieved October 16, 2012. ^ "Antigo Post Office". National Register or State Register. Wisconsin Historical Society. Retrieved 2014-06-11. 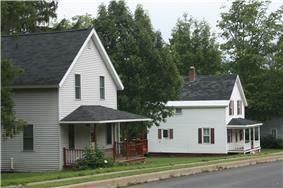 ^ "Center Avenue Historic District". Wisconsin Department of Tourism. Retrieved 2011-12-14. ^ "First Street Bridge (Merrill)". Architecture and History Inventory. Wisconsin Historical Society. Retrieved 2014-06-12. ^ "Lincoln County Courthouse". Wisconsin Department of Tourism. Retrieved 2011-12-14. ^ "Lincoln County Courthouse". Architecture and History Inventory. Wisconsin Historical Society. Retrieved 2014-06-12. 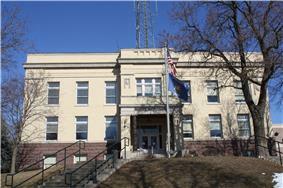 ^ "Merrill City Hall". Wisconsin Historical Society. Retrieved 2011-12-11. 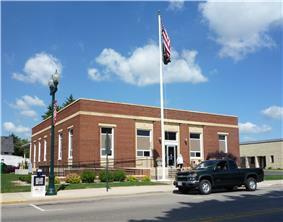 ^ "Merrill Post Office". National Register or State Register. Wisconsin Historical Society. Retrieved 2014-06-12. ^ "T. B. Scott Library". Wisconsin Department of Tourism. Retrieved 2014-06-12. ^ "Scott, T. B., Free Library". National Register or State Register. Wisconsin Historical Society. Retrieved 2014-06-12. ^ "Atwood, Ormsby and Green family papers, 1853-1998". Wisconsin Historical Society. Retrieved 204-06-14=5. ^ "John Muir Lake". Photograph. Wisconsin Historical Society. Retrieved 2014-06-15. ^ "Marquette Co. Courthouse, Sheriff's Office and Jail". Wisconsin Historical Society. Retrieved 2014-06-15. ^ Sprain, Fran (1991). Place and Faces in Marquette County, Wis, Vol. I. Westfield, WIsconsin: Isabella Press. ^ "Charles Samuel Richter House". Architecture and History Inventory. Wisconsin Historical Society. Retrieved 2014-06-15. ^ "Vaughn's Hall and Blacksmith Shop". Waymarking.com. Retrieved 2011-12-15. ^ "St. Joseph of the Lake Church and Cemetery". ^ "Durand Free Library". 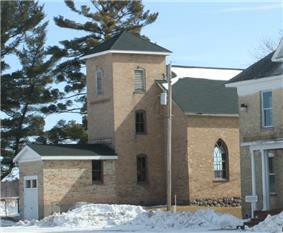 Wisconsin National Register of Historic Places. Wisconsin Historical Society. Retrieved 2011-12-19. 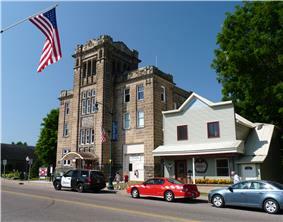 ^ "Old Courthouse Museum and Jail". Pepin County Historical Society. Retrieved 2011-12-19. ^ "The Mero (Diamond Bluff) Site". From Site to Story. The Institute for Minnesota Archaeology. Retrieved 2011-12-29. ^ "Freeman, Roscius S. and Lydia R., House". 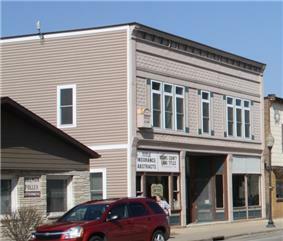 Wisconsin National Register of Historic Places. Wisconsin Historical Society. Retrieved 2011-12-27. 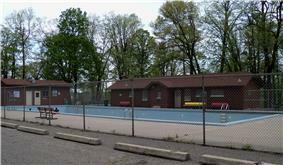 ^ "Glen Park Municipal Swimming Pool". 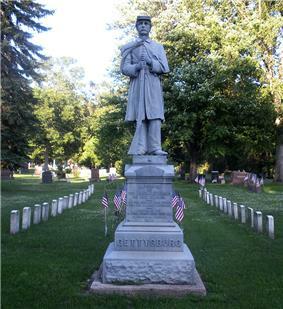 Wisconsin National Register of Historic Places. Wisconsin Historical Society. Retrieved 2011-12-27. ^ "H. S. Miller Bank". Architecture and History Inventory. Wisconsin Historical Society. Retrieved 2014-06-15. ^ "Welcome and Heritage Center". Wisconsin Department of Tourism. Retrieved 2011-12-27. 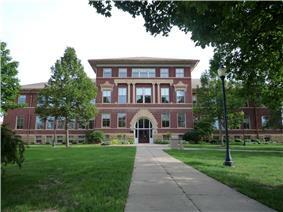 ^ "North Hall, River Falls State Normal School". Architecture and History Inventory. Wisconsin Historical Society. Retrieved 2014-06-15. ^ "Main Page Photos of Wisconsin Courthouses". Wisconsin Register of Deeds Association. Retrieved 2011-12-27. ^ "Smith, Daniel, House". National Register or State Register. Wisconsin Historic Society. Retrieved 2014-06-15. ^ "South Hall History". About Us. University of Wisconsin - River Falls. Retrieved 2011-12-27. ^ History of Rusk County Wisconsin. Dallas, Texas: Taylor Publishing Company. 1983. p. 344. ^ "State Bank of Ladysmith (aka Pioneer Bank 1927-1964)". Architecture and History Inventory. Wisconsin Historical Society. Retrieved 2013-06-12. ^ "Hall-Raynor Stopping Place". Architecture and History Inventory. Wisconsin Historical Society. Retrieved 2014-02-27. ^ Rosholt, Malcolm (1982). Lumbermen on the Chippewa (PDF). Rosholt House. pp. 275–277. ^ "North Wisconsin Lumber Company Office". Architecture and History Inventory. Wisconsin Historical Society. Retrieved 2013-06-12. ^ "Ojibwa Courier Press Building". Wisconsin Historical Society. Retrieved 2011-10-21. ^ Schroeder, Marian (Sprint 2011). "History Goes Up in Smoke!" (PDF). 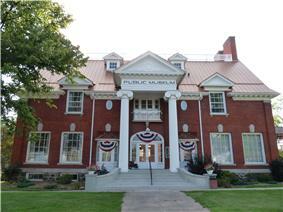 Pulaski Area Historical Society, Inc. Newsletter. Retrieved 2011-12-29. 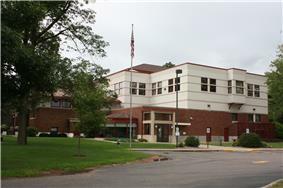 ^ "Lincoln School". National Register or State Register. Wisconsin Historical Society. Retrieved 2014-02-27. ^ Keiser, Albert (1922). "Lutheran mission work among the American Indians". Augsburg Publishing House. Retrieved 2011-12-29. ^ "Shawano". Wisconsin Historical Society. Retrieved 2011-12-29. ^ "Shawano, WI New Deal Art". Nancy Lorance. Retrieved 2011-12-29. ^ "Tigerton Village Hall and Engine House". 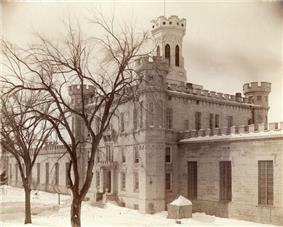 Wisconsin National Register of Historic Places. Wisconsin HIstorical Society. Retrieved 2011-12-29. ^ "J. W. Benn Building". Architecture and History Inventory. Wisconsin Historical Society. Retrieved 2014-03-02. ^ Robert A. Birmingham (1986). Edgar S. Oerichbauer, ed. Stray Bands and Dream Dancers: Indian Farms and Potawatomi Settlement in Central Wisconsin During the Late 19th and Early 20th Century. Burnett COunty Historical Society. ^ "Jump River Town Hall". Purcell and Elmslie, Architects. organica.org, John Panning. Retrieved 2011-12-30. 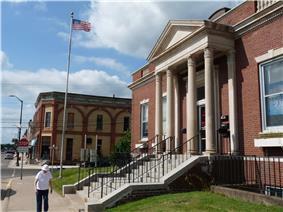 ^ "Medford Free Public Library - National Register of Historic Places". Wisconsin Historical Society. Retrieved 2011-05-09. ^ "Medford Post Office". Architecture and History Inventory. Wisconsin Historical Society. Retrieved 2014-03-02. ^ "Mondeaux Dam Public Utility Area". Architecture and History Inventory. Wisconsin Historical Society. Retrieved 2014-03-02. ^ "St. Ann's Catholic Church and Cemetery". Architecture and History Inventory. Wisconsin Historical Society. Retrieved 2014-03-02. ^ "Main Page Photos of Wisconsin Courthouses". Wisconsin Register of Deeds Association. Retrieved 2011-12-30. 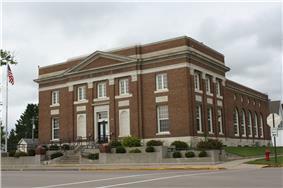 ^ "Taylor County Courthouse". Architecture and History Inventory. Wisconsin Historical Society. Retrieved 2014-03-02. ^ "Mrs. Richard Polson House". Wisconsin National Register of Historic Places. Wisconsin HIstorical Society. Retrieved 2011-12-30. ^ "Mrs. Richard Polson House". The Prairie School Traveller. Retrieved 2011-12-30. ^ "An Early Description of Spooner, Its People and Businesses". Spooner Advocate. 1903-02-27. Retrieved 2011-12-30. ^ Tarr, Sharon. "Spooner Heritage Tour". Spooner Web Tech. Retrieved 2011-12-30. ^ Adams, Peter J. (1988-02-04). "Kimball, Alanson M., House" (PDF). NRHP Inventory-Nomination Form (US Dept. of the Interior). National Park Service. Retrieved 2015-04-27. ^ "Alanson M. Kimball House". Architecture and History Inventory. Wisconsin Historical Society. Retrieved 2014-03-02. ^ "221 S Ste. Marie St.". Architecture and History Inventory. Wisconsin Historical Society. Retrieved 2014-07-22. 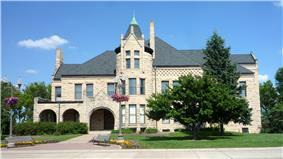 ^ "Waushara County Courthouse". Architecture and History Inventory. Wisconsin Historical Society. Retrieved 2014-07-22. ^ Birmingham, Robert A.; Leslie E. Eisenberg (2000). Indian Mounds of Wisconsin. Madison, Wisconsin: University of Wisconsin Press. p. 207.